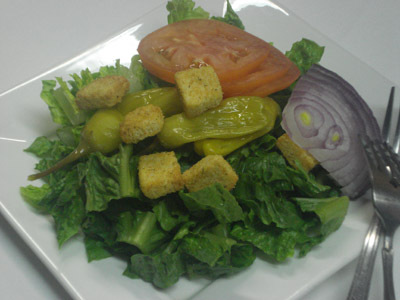 Starts with fresh crisp romaine lettuce, topped with herb croutons, fresh parmesan cheese, and a creamy caesar dressing. Start with fresh crisp romaine lettuce, topped with diced cucumber, tomato, black beans, corn, thin sliced red onion, with southwest dressing. Fresh mixed lettuce, thin sliced smoked turkey, honey glazed ham, bacon bits, crumble bleu cheese, sliced eggs, tomato, served with bleu cheese dressing. Crisp mixxed lettuce, slice of roast turkey, honey glazed ham, cheese, tomato, served with home made ranch dressing. Starts with a bed of crisp green lettuce, topped wth julienne carrots, cucumbers, sliced mushrooms, diced tomatoes, served with light italian dressing. Start with our signature grilled marinated chicken breast, on a bed of crisp nappa cabbage, green cabbage, red cabbage, mandarin oranges, topped with toasted almonds, served with lite poppy seed dressing. A delightfully healthy salad including the freshest seasonal fruit available. Crisp romaine lettuce topped with red onion, cucumber, black olive, pepperonchini, tomato and feta cheese, served with greek dressing.